Saturday November 2 1907 I did cooking and sweeping in forenoon. There was such a cold wind I did not attempt to go down town in the afternoon Will went. there was a big football game. I sewed all afternoon and finished up my visits. I read in evening. We heard today that Lew Price was quite sick. Sunday November 3 1907 I went to church in the morning and Will came down on a later car so we walked over home together. Father was not up till dinner time. Soon as Dr Dean comes home he will come over to see him. Mother had a good dinner and we had a nice visit. It was bright and cool. I came home at 4.20 got supper and went down to Coralville church. 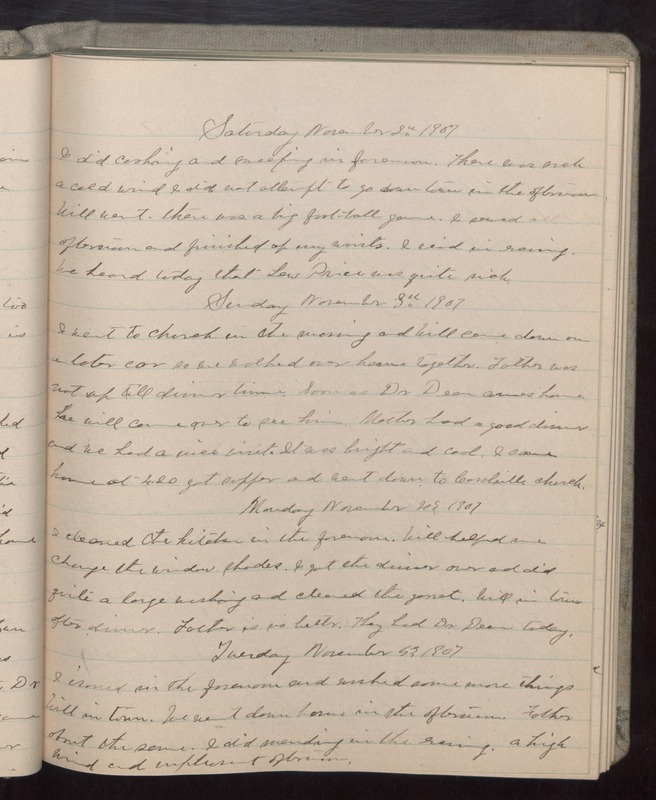 Monday November 4 1907 I cleaned the kitchen in the forenoon. Will helped me change the window shades. I got the dinner over and did quite a large washing and cleaned the garret. Will in town after dinner. Father is no better. They had Dr Dean today. Tuesday November 5 1907 I ironed in the forenoon and washed some more things Will in town. We went down home in the afternoon. Father about the same. I did mending in the evening. a high wind and unpleasant afternoon.